A gratin has the same effect on me as pizza or lasagna, I just want to cuddle up on the sofa and get cosy. 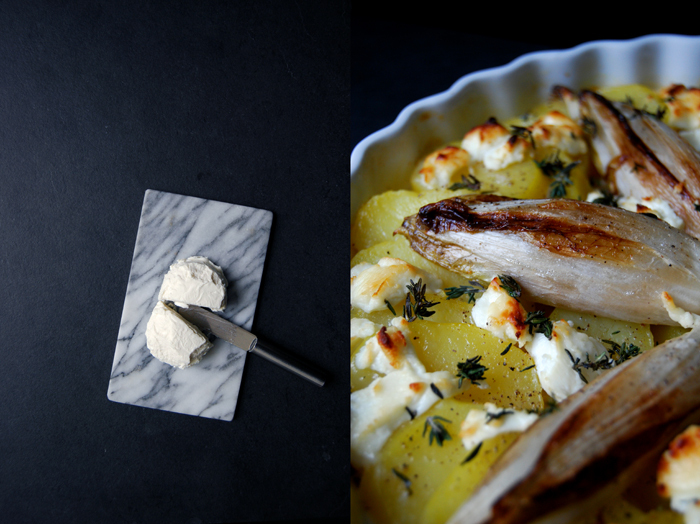 This dish spreads such a beautiful aroma of baked cheese and herbs through my flat, it instantly relaxes me. Sometimes I just sit in front of the glass oven door, enjoying the scene of bubbling cream and cheese that turns from an unspectacular pale white to a landscape of golden brown peaks. They look like tiny volcanos with dark tips ready to burst. 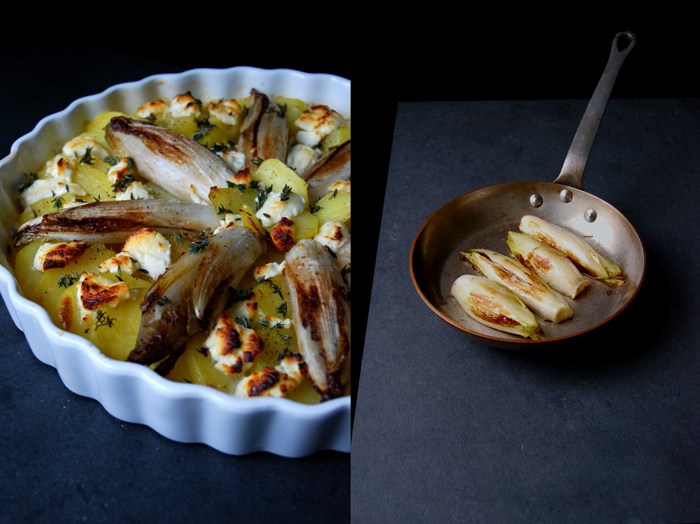 It’s just a gratin but when you look at it long enough it carries you away! 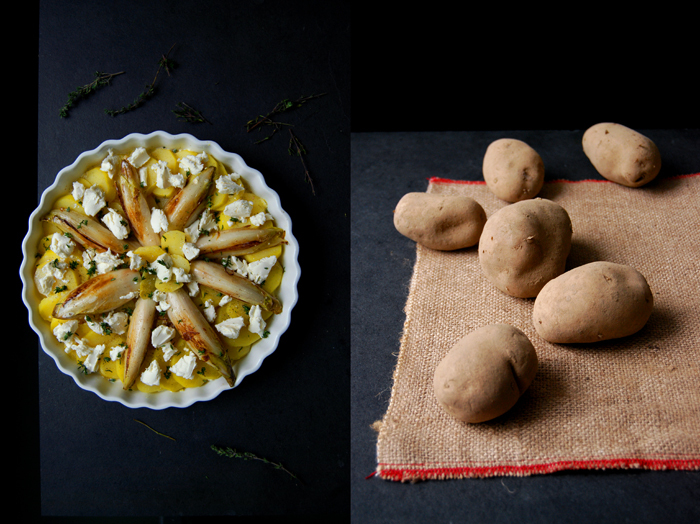 I don’t remember how many different potato gratin recipes I have tried out in my kitchen, there were so many. 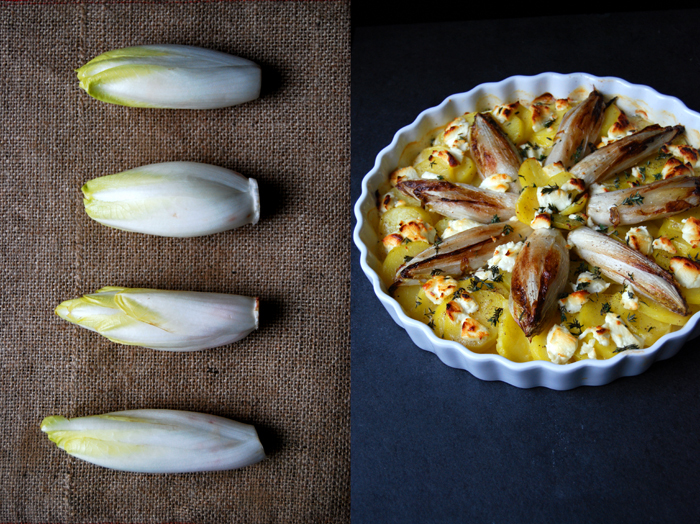 I shared the ones with dried porcini, black pudding, apples or parsnips and today there will be a new addition to the selection: Potato and endive gratin with chèvre and thyme! The combination is great, quite strong with sweet, bitter, milky and woody flavours. I wanted a quick dish, so I boiled the potatoes and sautéed the endives before I baked them with cream and milk in the oven. You could easily come up with some variations and use raclette or blue cheese instead of the chèvre, or add some slices of pears or apples, mix in some chopped rosemary or whatever comes to mind to suit your cosy dinner. 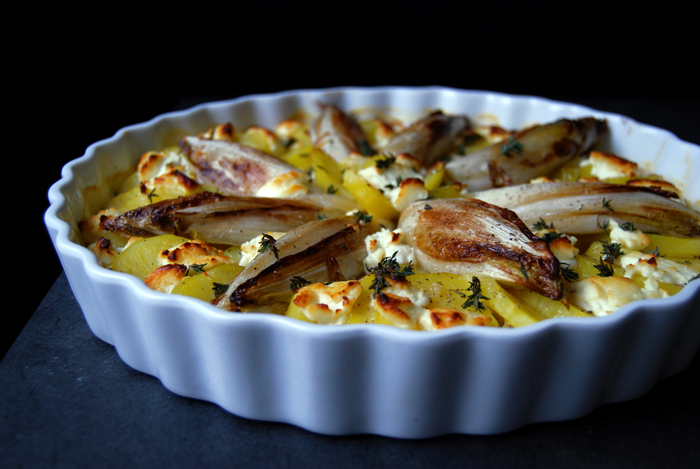 Set the oven to 200°C / 390°F and butter a round 28cm / 11″ gratin form or baking dish. 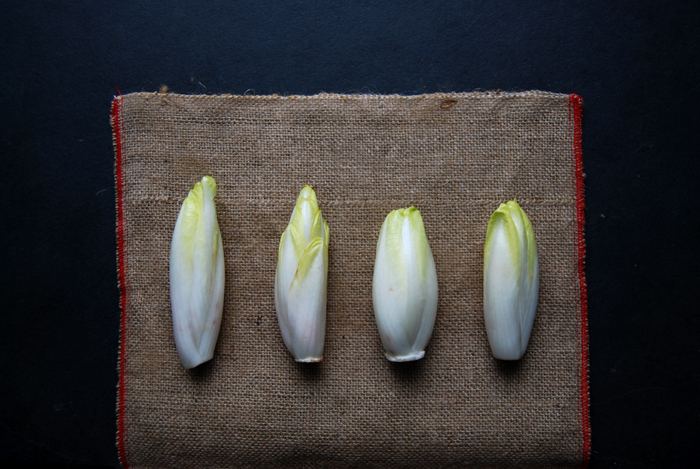 In a pan, heat a splash of olive oil and butter and sauté the endives for 2 minutes on each side on medium-high. Season with salt and pepper. Whisk the cream and milk and season with salt, pepper and nutmeg. 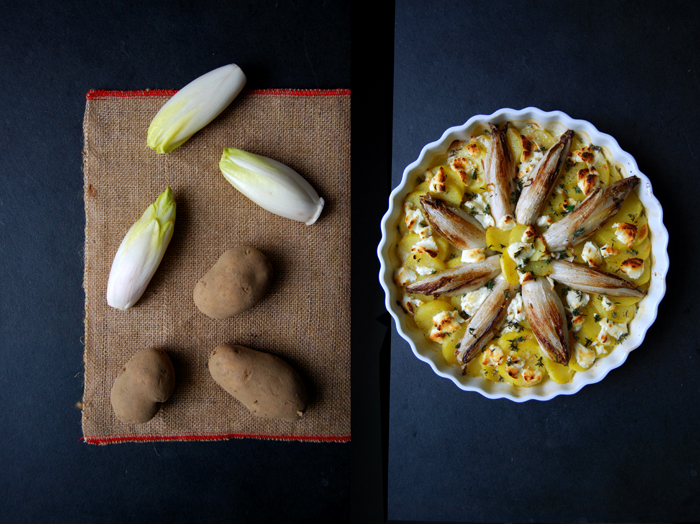 Arrange the potatoes and endives in the buttered dish and pour the cream and milk mixture over the vegetables. Sprinkle with chèvre and thyme and bake for 18 minutes. Turn the oven down to 160°C / 320°F and bake for another 5 minutes or until golden brown. Let the gratin cool for a few minutes before serving and season with pepper to taste.